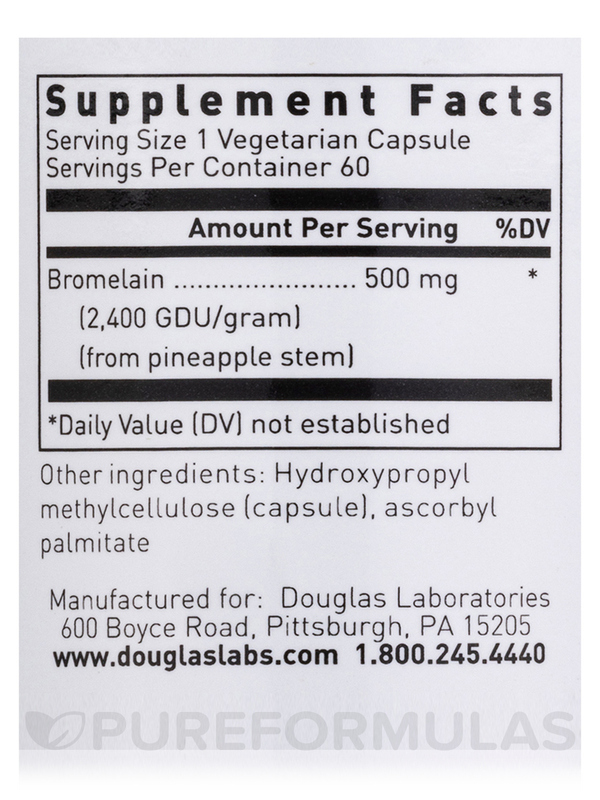 I take 1 tablet of Bromelain-5000 by Douglas Laboratories nightly (for 4 years now) and it eliminates painful finger joints, and reduces painful foot problems. If you suffer from inflammation in your joints‚ you know the pain is nearly unbearable at times. The condition even takes a toll on your ability to complete daily tasks that used to be simple‚ such as bending to tie your shoes. Certain health conditions require you to take steps to reduce inflammation‚ which will ultimately reduce the pain. 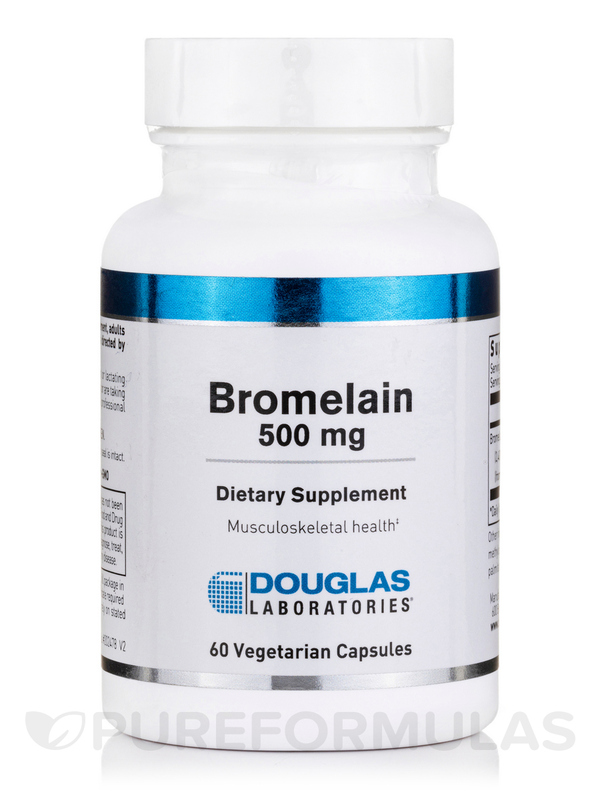 Douglas Labs’ Bromelain-5000 is one option to help you decrease the amount of inflammation. The active ingredient bromelain—which is derived from the lower stems of the pineapple plant—reduces pro-inflammatory prostaglandins‚ unsaturated fatty acids that lead to inflammation. 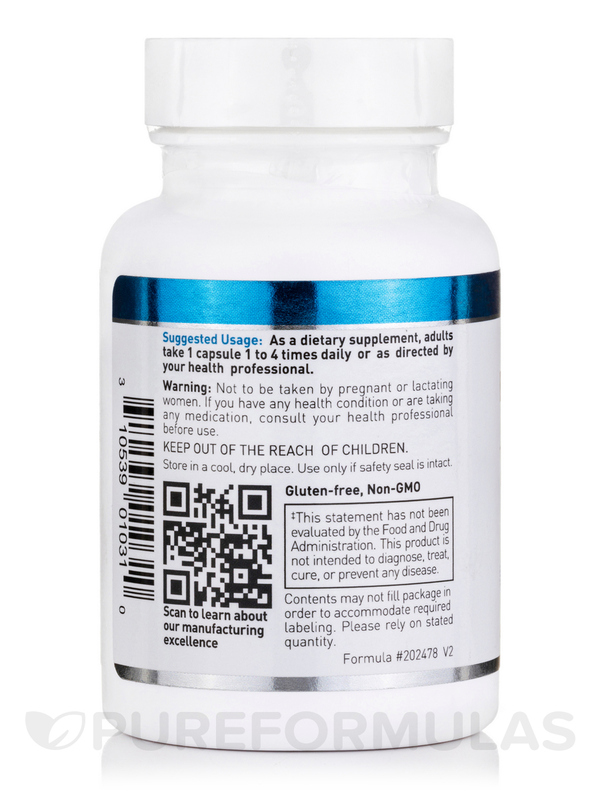 In addition‚ the bromelain in this supplement has been shown to support healthy immune response‚ while also preventing allergens from entering your gastrointestinal tract. 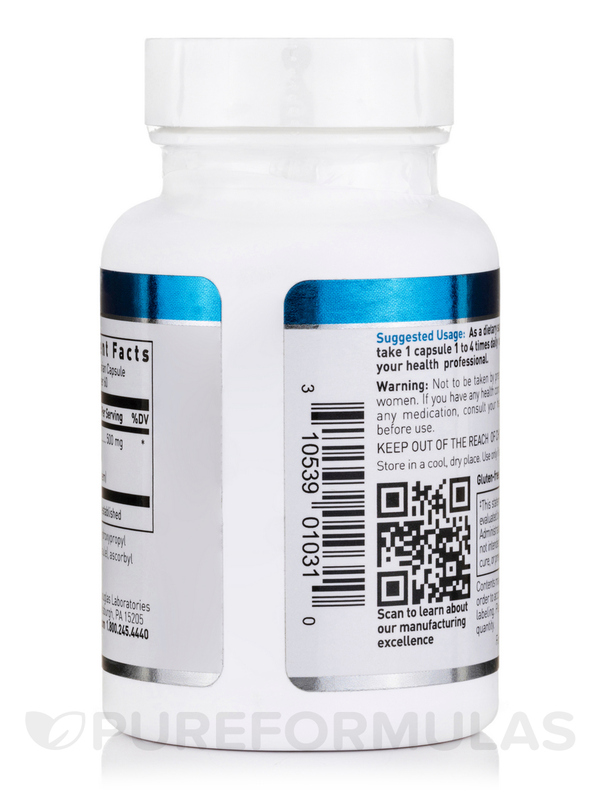 You may also benefit from taking this product if you have an inflammatory bowel condition such as ulcerative colitis. Other benefits that Bromelain-5000 may have include the reduction of hay fever symptoms‚ as well as the enhancement of protein digestion. Some evidence suggests that Bromelain-5000 assists with the healing process after an injury or surgery; this is due to the fact that it's thought to decrease swelling‚ inflammation‚ pain‚ and bruising. Generally‚ nonsteroidal anti-inflammatories (NSAIDs) are used to relieve this pain and inflammation. Certain pain medications reduce the pro-inflammatory prostaglandins; however‚ the enzymes found in Bromelain-5000 may have the same effect with only natural ingredients. Bromelain is the sole active ingredient in this supplement‚ and you should take it between one to three daily‚ unless your health care professional recommends otherwise. 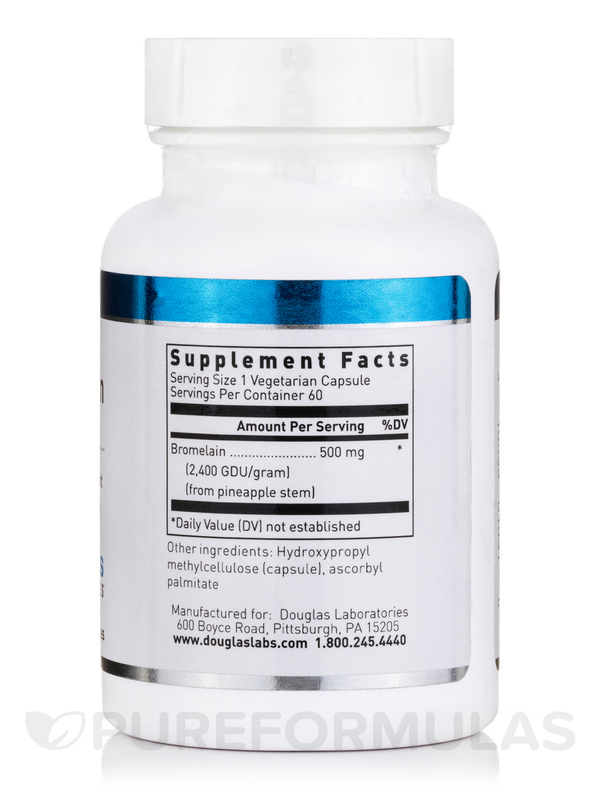 Typically‚ one 60-capsule bottle of Bromelain-5000 by Douglas Laboratories should last between 20 days and two months. Other Ingredients: Hydroxypropyl methylcellulose (capsule)‚ ascorbyl palmitate. 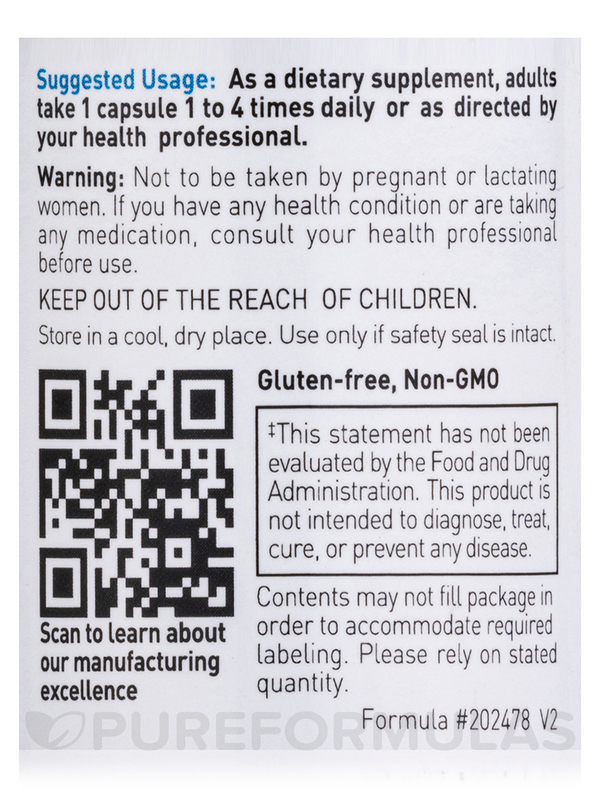 As a dietary supplement‚ adults take 1 capsule 4 times daily or as directed by your health professional. Small, easy to swallow. Works great for arthritis. If you have a sensitive stomach, I wouldn't recommend Bromelain-5000 by Douglas Laboratories. Have started a regime of this as suggested by a doctor friend of mine. Seems to help my neck and back pain...natural and by a reputable lab. The ordering process is painless and the product came well packed and quickly...price is also excellent and we are grateful to pureformulas! Ive been taking Bromelain-5000 for post surgical swelling and allergies for two years and recently switched to Douglas Laboratories brand two months ago as recommended by my nutritionist. He is very picky about the brands he recommends and I have been very happy with the switch. Ive used fewer capsules with better results. Works better than previous brand. Can use less with better results. Bromelain is a great product-will definitely order again when I run out! Recommended for joint / arthritus pain. My wife and I have been taking Bromelain-5000 by Douglas Laboratories under the advisement of her chiropractor for relief from joint and arthritus pain for nearly 6 months now. We both agree that we have noticed an improvement in our health related to joint pain and stiffness and attribute the positive results to Bromelain-5000. We both would recommend Bromelain-5000 for joint and arthritus pain/stiffness relief. From what countries, or what state in the USA does Douglas Labs source their pineapple stems? my cousin gave this product to my mother and told her it would clean out her arteries and she would not have to take baby aspirin. Where is he getting this info. Plus I took it and have not slept for 36 hrs. It is like ritalin. what is it? Thank you for reaching out to us, Madeleine. This is a question that your trusted healthcare practitioner would need to answer. They would be able to give you the best response possible since they’d be familiar with your particular health history and needs.